For the Supermciro X7SPE-HF-D525 pfSense appliance I discussed in the linked post I of course wanted a chassis for my appliance and decided to purchase the CSE-502L-200B for just under $70 (see ebay and NewEgg). Oftentimes one does not need a massive chassis for a server. 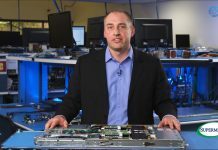 Frankly, with all of the mITX and mATX form factor boards out there, and all of the onboard features the boards have, there are a lot of applications where people do not need a large/ deep chassis. Using a shallower rackmount chassis allows one to use much smaller lightweight wall mounted network rack or telco post rack which saves a lot of space. 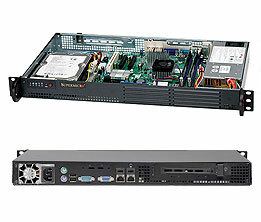 As a result, for my Atom based pfSense appliance, I purchased a Supermicro CSE-502L-200B. I am happy with the purchase but have provided some feedback to Supermicro and want to make sure those looking to purchase the case know that there are some significant limitations. While there were cheaper mITX cases out there with which I could have used a mITX X7SPA-HF-D525, but I decided to go with a matching case. Purchasing the two separately was less expensive than purchasing a full SuperServer 5015A-EHF-D525 which had both the motherboard and chassis included with a PCIe riser so I would advise pricing both ways out before purchasing. The layout of the CSE-502L-200B is very simple. The front of the chassis has simple indicator lights and buttons one would expect from any case including power and reset buttons. The chassis cover pops off easily after unscrewing side and one rear screw. The chassis is a 1U so one needs to use a low-profile USB stick for internal USB headers when making a pfSense/ FreeNAS/ unRAID appliance. Looking from the rear of the chassis, the leftmost area is set aside for a small 200w power supply. The power supply is my first limitation of this chassis that must be mentioned. It seems to be a good unit, but there is one major concern I have of it. It makes a distinct, fairly low pitch fan noise during normal operation. I really like the idea of having a power supply included in this chassis. It makes a TON of sense. Realistically though, one has a low power motherboard, possibly two DIMMs an expansion card and a hard drive or SSD. In such a small case with no other ventilation, I understand the need to have one fan, but on the other hand, anyone putting 150w of heat-dissipating components into the case will likely be unhappy as there is not enough airflow to handle that much. With that being said, I would hope that in the next revision Supermicro looks at a ~125w source. One might be able to put up to four SSDs/ one SSD and one 3.5″ drive in the chassis, and a very small add-in card with some creative mounting and a FlexATX or mITX motherboard, so design for that rather than going “big” with a 200w power supply that makes a lot of noise. 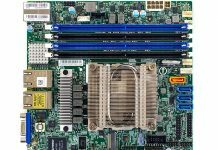 The noise is not the worst, but it is something that I wish Supermicro addressed as fixing that point is one of two things that can make this an absolute home-run chassis. Inside the chassis, next to the power supply is room for a mITX, FlexATX, or even a mATX motherboard. One note here, the mATX motherboard is going to be a very tight squeeze. Realistically, since this is a 1U chassis, and because it is fanless otherwise, I would only recommend this chassis with Supermicro’s X7SPA/X7SPE motherboards which are mITX and FlexATX respectively. 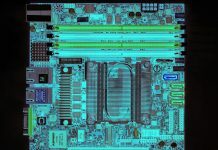 One can see from the product page picture that there was likely a mATX Celeron platform originally slated for the chassis, but I would stay Atom. On that subject, and as can be seen in the image above, the second limitation that I found is that the rear I/O shield is not detachable and interchangeable. Yikes! What this means is that if you do not use a board that is compatible with the rear I/O shield, you are likely in trouble. The Supermicro Atom line works well here but you should not expect to plug any motherboard in and have it fit properly, especially of the mATX variety. In the picture above one can also see the PCIe slot that requires a 1U riser. 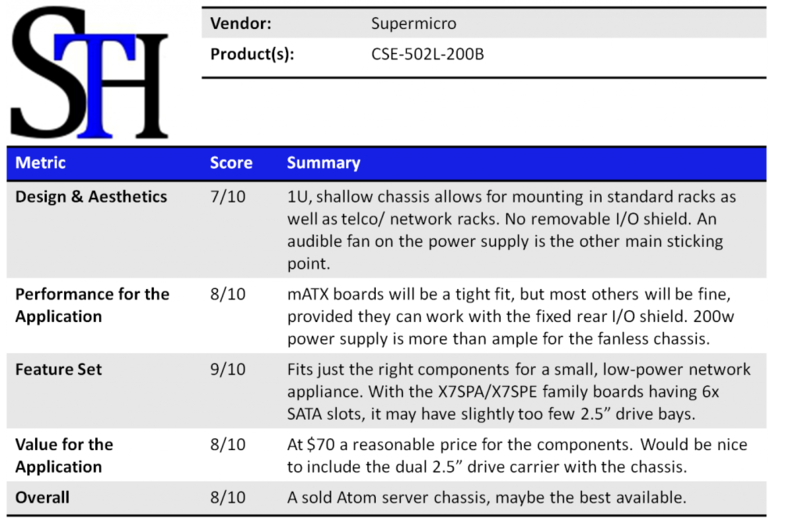 The riser does not come with the chassis, and one will want to utilize the Supermicro X7SPE family (like the recently reviewed X7SPE-HF-D525) in conjunction with the riser to fit into this chassis. Below the riser is a mounting point for a 3.5″ hard drive which screws in from below. One can also utilize a dual 2.5″ bracket (part number MCP-220-00044-0N ~$11 on ebay) if they want to use up to two SSDs with the chassis. 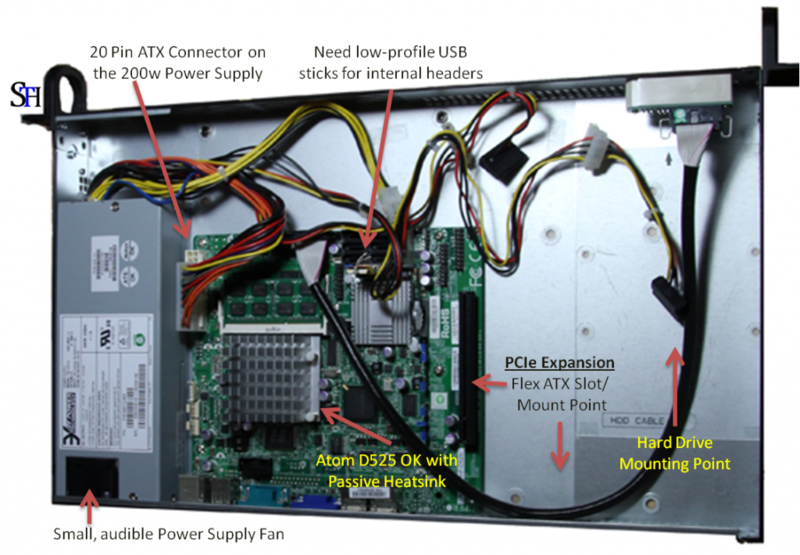 Overall, this is one item that I am very happy about purchasing for myself, yet I have to admit, it would have been nice if Supermicro fixed the buzzing 200w power supply fan, even if that meant lowering the wattage rating, and adding a removable rear I/O shield. The buzzing, practically speaking, means that this is going to have to sit in my rack, rather than being in my office. I will likely change the power supply out with a PicoPSU at some point because of this, but those do cost more than the entire chassis plus PSU cost me. I’ve used this server before for my Windows application. System has very minimum noise level (hence i can use at my home) and doesn’t require too much power. Sentral was also offering system with IPMI for remote management, but to be honest I didn’t require it as I use server at office/home.